I spent the weekend in New York, and was able to spend a full day at the American Museum of Natural History. I’m a fan of New York, it’s just brimming with culture and has a neighborliness that one doesn’t see many other places. It had been much too long since I had been there, and even longer since I had been to AMNH. There’s a fair bit of brain dumping I’d like to accomplish on the topic of the museum, so I’ll probably be posting thoughts on the permanent paleobiology galleries and the mobile app fairly soon. For now, however, I really need to take a moment to gush about The World’s Largest Dinosaurs. A typical dinosaur exhibit is based on the spectacle of the mounted skeletons. The curtain is raised on the strange and spectacularly large dinosaur bones, everybody oohs and ahhs, and that is all most/many visitors get out of it. Moreover, people leave (and probably came in with) the impression that paleontologists are people who dig up dinosaur bones and then put them on display. Such is not the case with The World’s Largest Dinosaurs, a new temporary exhibit at AMNH. The World’s Largest Dinosaurs is unique because it is not focused on skeletal mounts. There are no mounts to speak of in the gallery, and in fact, there are very few fossils on display at all. This exhibit provides a window into what vertebrate paleontologists do after they dig up the bones. 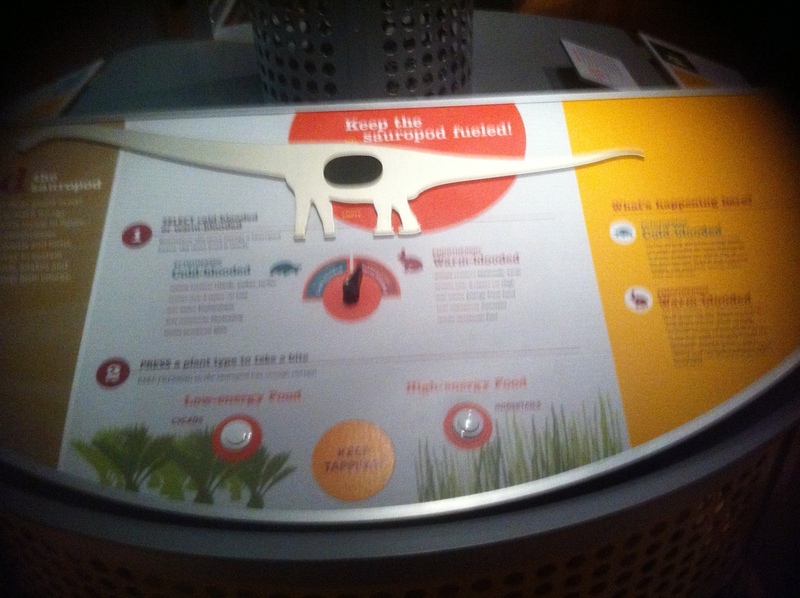 Specifically, it is about sauropod biology. There has been a lot of really fascinating research into sauropod biology in the last 10-15 years, asking and answering questions such as, how did they carry all that weight? How did they reproduce? How did they get enough to eat? And of course, what’s the deal with those pneumatic bones? These questions are all explored in this exhibit. A crappy image of an interactive display. The layout of The World’s Largest Dinosaurs is very effective. Visitors are oriented in a narrow space that clearly lays out the topic at hand. Using skeletons of modern animals as comparisons, the questions that the very existence of sauropods raise are introduced to visitors (i.e., how did they get away with being so effin big?). Once the question is laid out, the exhibit opens up into a large space with many stations that address different research questions. The “ooh and ahh” factor is covered by a life-size model of a Mamenchisaurus in the center of the gallery, which doubles as a projection screen: animations of the circulatory, respritory and reproductive systems are displayed right on the model, accompanied by narration (see below). Mamenchisaurus projection screen. From http://gothamist.com. I was at AMNH on what turned out to be a very crowded day (no surprise, it was a rainy day on a holiday weekend), but I managed to get into the day’s earliest time slot, before it got too packed. When I was there at least, it was quiet enough for people to see the exhibits, and to get ahold of the interactives. As such, I observed people around me engaging with and understanding the material. Kids were working through the problems presented in the exhibit, despite the attempts of their parents to dumb down their experience and herd them through faster. The non-paleo people I were interested enough to read just about everything. Importantly, I heard no complaints that there weren’t many fossils on display. This is interesting, given how vocal some museum visitors can be about the exhibition of casts. Evidently, The World’s Largest Dinosaurs succeeded in entertaining and educating people without traditional mounted skeletons. I think this could potentially be a very big deal, and could cause museums to rethink the way paleontology exhibits are designed. Pingback: How much is too much? (AMNH Part 2) | DINOSOURS!